Hunt, shepherd, farm, shop – judge? After Smith gave some basic insight into what judges do, he had to tackle where they came from. Over the next few centuries after the Norman conquest, the curia regis split into multiple parts (Court of Common Pleas, Kings Bench, Exchequer and Court of Chancery), which Smith saw as an intentional strategy on the part of monarchs like Edward I to keep the judiciary weak. Smith appeared conflicted with regard to these developments. On the one hand, the Court of Chancery – the newest court – appeared to help innovation by allowing for the enforcement of performance of contracts and the transference of property, neither of which had been allowed under the common law. Yet Smith also regards the unchecked power of judges to innovate as a potential threat to liberty. Finally,Smith’s explanation of why judgments are obeyed might be derived from his overall theory of social cohesion. Contrary to social contractarian approaches,[ii] Smith believed that people join “civil society” because of two reasons: respect for authority, and because of the utility of doing so. As to the first, the poor and weak look up to the wealthy and strong, who are seen as happier. Likewise, older people may be respected on the basis of their life experience. The rituals associated with courts and the advanced age of many justices may therefore lend to their legitimacy. Indeed, Smith wrote that continuity rather than innovation in justice was desirable: “All new courts disdain to follow the rules that were formerly established. All new courts are a great evil, because their power at first is not precisely determined and therefore their decisions must be loose and inacurrate.” The utility reason might be described in contemporary terms as a network or imitation effect, whereby individuals’ compliance encourages others to comply: the fragility of property rights per se requires optimal compliance, and people in society in pitch in to make the law more effective. (Smith, 1763, at 280-284). 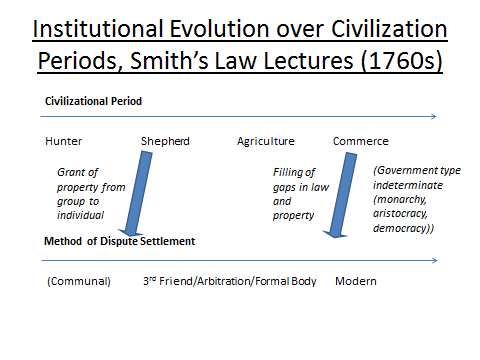 Figure 2 outlines how judicial development tracks civilizational development in Smith’s law lectures. While in parts of Smith’s writing, modern judging and the state seems to lag the development of commerce, Smith is also clear that modern judging only follows the creation of property, which is given through the coercive power of the collective. In addition to creating estate rights, the modern state later also fills in the gaps, as evidenced by the creation of Court of Chancery. Smith does not appear to believe that there is any automatic tendency to create a certain type of government, and notes that democracy both preceded and followed periods of concentrated power. [i] On this point, Smith is inconsistent. He argues that inequality during the shepherd phase creates a need for specialized courts, and that “laws and governments may be considered in this and indeed in every case as a combination of rich to oppress the poor, and preserve to themselves the inequality of the goods which would otherwise be soon destroyed by the attacks of the poor, who if not hindered by the government would soon reduce the others to an equality with themselves by open violence. The government and laws hinder the poor from ever acquiring the wealth by violence which they would otherwise exert on the rich…” He then immediately pivots to a point about government accordingly needing to maintain the buy-in of the poor through democracy. (Smith, 1763, at 196) But if the inequality is so injurious to the poor, why would they consent through government to oppress themselves? The mechanism (which presumably rests in some form of false consciousness or manipulation) is not outlined. [ii] Unlike other scholars of his time, Smith did not believe that government derives from a social contract, for three reasons. First, contract law as such existed primarily in England, but governments existed everywhere. Even supposing the existence of a contract at some point, nothing would bind the descendants of the parties to this contract. Finally, as for the theory that people agree implicitly to be bound by the social contract through not leaving the country, Smith noted that governments at the time restricted exit by law.